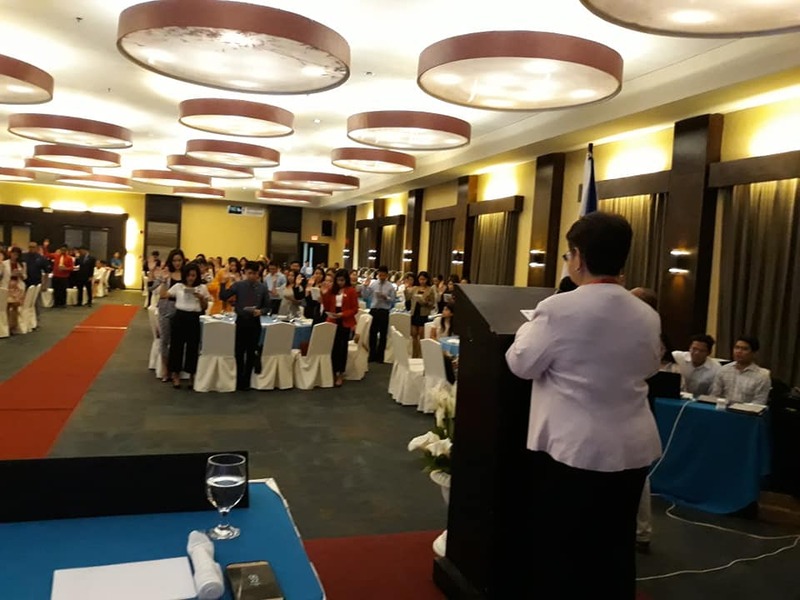 The X/XII/ARMM/CARAGA Chapter of the Integrated Chemists of the Philippines, under the leadership of its chapter president Mr Higinio Jr Barros, organized their first ever regional oath-taking ceremony of new chemists and chemical technicians last November 23 at the Mallberry Suites & Business Hotel in Cagayan de Oro City. A total of 115 newly-registered chemists and chemical technicians took their respective oaths. Gracing this historic event were ICP-National’s VP for External Affairs Ms. Edna Mijares, PRC Board of Chemistry’s Hon. Adoracion Resurreccion and Hon. Ma. Teresa Cayton, and PRC 2016 Outstanding Chemist Dr. Myrna Mahinay who served as the event’s keynote speaker. Congratulations to the ICP X/XII/ARMM/CARAGA Chapter for a successful hosting of the event, and congratulations to the newly-registered professionals! Membership to the ICP. Newly-registered chemists and chemical technicians are required to become members of the Integrated Chemists of the Philippines (ICP), the accredited professional organization of chemists and chemical technicians in the country recognized by the PRC. Kindly click on this link to learn how to become an ICP member. Oath-taking Ceremony of board-passers. The 2018 Oath-taking Ceremony of New Chemists and Chemical Technicians is organized by the PRC in coordination with the ICP, and will be held on November 22 at the Philippine International Convention Center, Metro Manila. Registration for this event is required. To learn more (including registration fees and procedure), visit www.icp.org.ph/oathtaking. Congratulations to this year’s board-passers, and welcome to the chemistry profession! The Asian and Pacific Coconut Community (APCC) is an intergovernmental organisation established by United Nations articles and operating under the auspices of UNESCAP. The members of APCC are National Governments of 18 countries in Asia, Pacific, Africa and Caribbean. APCC looks after the interests of the coconut farmers, most of whom are small landholders, the development of the coconut industry, and the over 1 billion consumers of coconut products worldwide. Dr. Fabian Dayrit, president of the Integrated Chemists of the Philippines, is also the chairman of the Scientific Advisory Committee for Health of the APCC. Written August 25, 2018. You may download this article at this link. This brief article is a point-by-point rebuttal against the claims made by Dr. Karin Michels that coconut oil is a ‘pure poison’ and that there is no study that shows significant health benefits of coconut oil consumption. This article will provide evidence that coconut oil is not a poison, does not cause heart disease, and is in fact, one of the healthiest oils in the world. False claim # 1. Coconut oil is ‘pure poison’. The standard way of determining toxicity is to determine its lethal dose, called LD50. The European Commission has determined that coconut oil has an LD50 of about 23 g/kg . According to this, the average 60 kg person will have to take almost 1.4 kg (or more than 1.5 liters!) of coconut oil to reach the toxic dose. Coconut oil is regarded as a food by Codex Alimentarius  and is classified as GRAS, or Generally Recognized As Safe, by the US FDA  and by all countries in the world. Given that Dr. Michels is presumably a knowledgeable scientist, her claim that coconut oil is ‘pure poison’ without any proof can only be considered as a highly unethical, irresponsible and malicious act. APCC demands a retraction and apology from Dr. Karin Michels. False claim # 2. Coconut oil is a solid at room temperature and is therefore similar to butter and lard. This is a highly unscientific and misleading way of determining whether a fat or oil is saturated or unsaturated. Coconut oil is, in fact, a liquid at room temperature in the tropics (it solidifies at around 25 degrees Celsius or 77 degrees Fahrenheit). Since coconut oil is solid at the colder room temperature in temperate countries, this is used by detractors to instill fear that it will clog arteries. This is deliberate misinformation. Since body temperature is 37 degrees Celsius, coconut oil will certainly not solidify inside one’s arteries. More important, the body’s enzymes (lipases) will metabolize coconut oil almost immediately upon ingestion. This is basic chemistry and it is truly surprising that this fear is being propagated by Dr. Michels and the other detractors of coconut oil who are expected to know better. We note that the Dietary Guidelines for Americans uses this very unscientific method to advise its public how to determine whether a food item is a saturated or unsaturated fat. The standard scientific method of determining whether a fat or oil is saturated or unsaturated is by the use of a gas chromatograph which is able to analyze fatty acids individually. 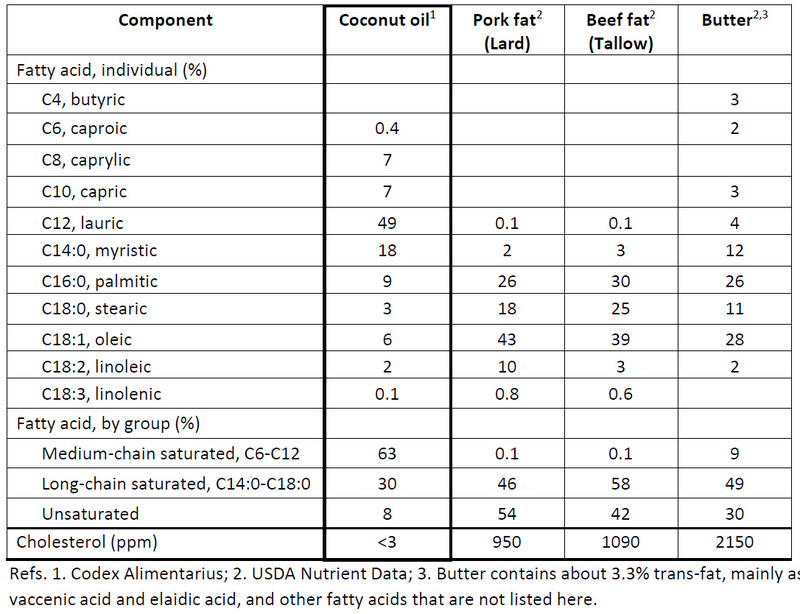 Table 1 gives the fatty acid profiles of coconut oil and various animal fats. Table 1. Approximate fatty acid profile and cholesterol content of coconut oil and various animal fats. 1. Coconut oil and animal fats have very different fatty acid profiles. Further, coconut oil has negligible amounts of cholesterol, while animal fats have considerable amounts of cholesterol. Thus, it is erroneous to say that coconut oil is similar to animal fat. 2. Coconut oil is a saturated fat, but it is 63% medium-chain (C6 to C12). Medium-chain fats are metabolized differently from long-chain fats and, in fact, have a number of beneficial properties. 3. Animal fats have considerable amounts of unsaturated fat (>30%) and should not be considered as saturated fats. This is an error that has been blindly accepted by generations of scientists since it was proclaimed by Ancel Keys. An extensive correction of the claims of nutritional science on “saturated fat” is in order. False claim # 3. Coconut oil causes heart disease. • Studies on traditional coconut-consuming societies. Tokelau and Pukapuka are remote islands in the Pacific and coconut is a major source of dietary energy, as is the case in all Pacific islands. In 1981, Prior and co-workers reported that Tokelauans and Pukapukans consumed 63% and 34%, respectively, of their diet from coconut. However, despite this high coconut intake, vascular disease was uncommon in both populations . Prior could see the onslaught of the Western diet on the Pacific islands and realized that it was important to document the health status of traditional coconut-consuming societies. In 1993, Lindeberg and co-workers reported that the inhabitants of Kitava Island, who consumed coconut as part of their staple, did not suffer stroke and ischaemic heart disease . • Studies on coconut-consuming societies that switch to the Western diet. Numerous studies have documented the decline in health status of populations that abandon their traditional coconut diet and switch to a Western diet. Prior and co-workers contrasted the higher morbidity and mortality of the Maoris who migrated to New Zealand versus those who stayed at home . Similarly, Stanhope and co-workers reported that in Tokelau, the islanders consumed 53% of energy from fat, 80% of which was from coconut, while migrants to New Zealand consumed less saturated fat and increased their sugar and carbohydrate consumption. Migrant males had higher mean concentrations of serum LDL and triglycerides and lower serum HDL than non-migrant males . Galanis and co-workers reported that American Samoans who shifted to a Western diet showed greater obesity and higher risk for CVD as compared with Western Samoans who retained their traditional island diet. American Samoans consumed more energy as carbohydrate and significantly less as fat and saturated fat . In its report entitled Diet Food Supply and Obesity in the Pacific, the World Health Organization noted that Pacific islanders were “2.2 times more likely to be obese and 2.4 times more likely to be diabetic if they ate imported fats than if they ate traditional fat sources.” The imported fats included vegetable oils and margarine while the traditional fats included coconut oil . • In a recent review of coconut oil consumption and cardiovascular risk factors, Eyres and co-workers reluctantly conceded that: “Observational evidence suggests that consumption of coconut flesh or squeezed coconut in the context of traditional dietary patterns does not lead to adverse cardiovascular outcomes,” but added that: “However, due to large differences in dietary and lifestyle patterns, these findings cannot be applied to a typical Western diet.”  However, his reason for saying this was not explained in the paper. • Coconut oil accounts for less than 5% of the total vegetable oil consumption in the US  and much of this is processed into hydrogenated coconut oil. Many of the studies that link coconut oil with heart disease were done in the US where hydrogenated coconut oil is the food item that is consumed, not coconut oil . Hydrogenated coconut oil can be found in artificial coffee creamers, cake mixes and bakery products. Thus, coconut oil cannot be logically linked to heart disease in the US, so detractors use statistical tools. False claim # 4. There is no study that shows significant health benefits of coconut oil consumption. • Coconut oil is antibacterial: Numerous reports have been published on the antimicrobial properties of lauric acid, the major fatty acid in coconut oil, and monolaurin, its natural derivative. These are effective against Staphylococcus aureus  and Heliobacter pylori, the causative agent of stomach ulcers , among others. Virgin coconut oil (VCO) has been found to be very effective against skin S. aureus infection, especially in the proactive treatment of atopic dermatitis . Coconut oil has been endorsed by the World Dental Association as an antibiotic that can combat tooth decay . The antibacterial activity of coconut oil takes on special significance today when the number of antibiotic resistant bacteria is rapidly increasing with no affordable antibiotics in sight. • Coconut oil improves the lipid profile: A recent study was done involving 94 European Caucasian volunteers who were randomized to one of three interventions: VCO, extra-virgin olive oil, or unsalted butter, at 50 g daily for 4 weeks. Coconut oil and olive oil gave similar LDL cholesterol profiles which were much lower compared with butter. In addition, coconut oil significantly increased HDL cholesterol compared with butter and olive oil . • Coconut oil has anti-inflammatory properties: VCO supplementation has anti-inflammatory effects in the kidney which has been attributed to its antioxidant activity . • Coconut oil has anti-cancer properties: In an in vitro study, lauric acid, the major fatty acid in coconut oil, was shown to activate apoptosis (or cell death) in cancer cells, which indicates that coconut oil has potential as a therapeutic agent . The phenolic fraction of VCO is an antioxidant and cytotoxic agent against hepatocellular cacinoma (HepG2) cells . In its so-called “Presidential Advisory”, the American Heart Association decried the fact that: “A recent survey reported that 72% of the American public rated coconut oil as a “healthy food” compared with 37% of nutritionists. This disconnect between lay and expert opinion can be attributed to the marketing of coconut oil in the popular press.”  However, it is more likely that the American public have finally realized that the AHA and the Dietary Guidelines have been making them obese. As Cohen and co-workers correctly observed: “Americans have been following dietary guidelines, coincident with the rise in obesity” . This can be clearly seen when one compares the dietary advice with the rise in overweight and obesity in the US (Table 2). Table 2. Anti-saturated fat advice of the Dietary Guidelines and the rise of the prevalence of overweight and obesity in adults in the US . 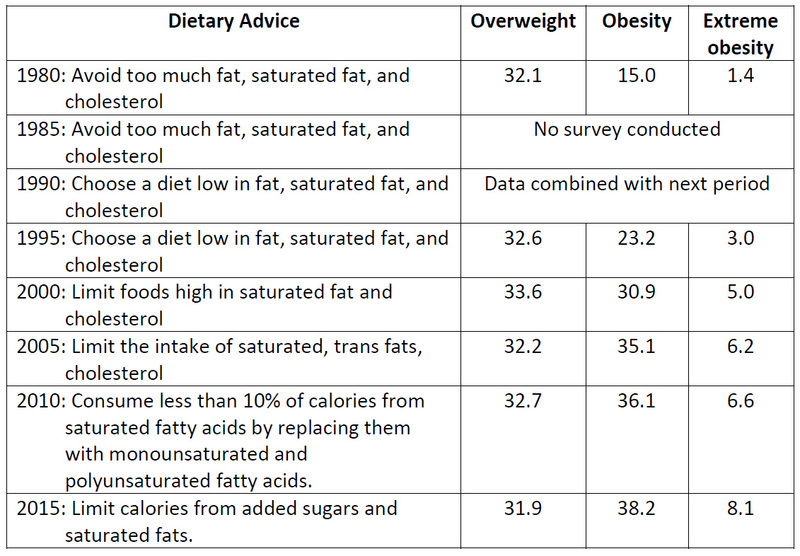 The advice of the Dietary Guidelines has made the Americans obese by demonizing saturated fat, including coconut oil. Unfortunately, this obesity-causing diet has been adopted by many other countries with the same consequences. As shown by the experience of the Pacific islanders, it is the Western diet that makes people obese and it is the traditional coconut diet that is healthy. Coconut oil may hold part of the solution to the rising obesity in the US, as well as the rest of the world. “If you tell a lie big enough and keep repeating it, people will eventually come to believe it.” The sensationalist attack by Dr. Michels is clearly such a lie that is just being repeated. There have been many attacks on coconut oil which, upon analysis, have been shown to be based on deliberate misinformation and false assumptions. This is a highly irresponsible use of science and a grave disservice to the people. The coconut has a tradition dating back several thousands of years and is unique in being revered by many so cultures as the “Tree of Life.” The truth is that the coconut and coconut oil are among the healthiest gifts that nature has given us. We should use science and technology to ensure the development of these gifts for the benefit of the people and the coconut farmer. 4 I. A. Prior, F. Davidson, C. E. Salmond, Z. Czochanska, Cholesterol, coconuts, and diet on Polynesian atolls: a natural experiment: the Pukapuka and Tokelau island studies. Am. J. Clin. Nutr. 34, 1552-1561 (1981). 5 S. Lindeberg, B. Lundh, Apparent absence of stroke and ischaemic heart disease in a traditional Melanesian island: a clinical study in Kitava. J. Int. Med. 233, 269-275 (1993). 6 I. Prior, Epidemiology of cardiovascular diseases in Asian-Pacific region. Sing. Med. J. 14(3), 223-227 (1973). 7 J. M. Stanhope, V. M. Sampson, I. A. M. Prior, The Tokelau island migrant study: serum lipid concentrations in two environments. J. Chron. Dis. 34(2–3), 45–55 (1981). 8 D. J. Galanis, S. T. McGarvey, C. Quested, B. Sio, S. Aafele-Fa’amuli, Dietary intake of modernizing Samoans: implications for risk of cardiovascular disease. J. Am. Diet Assoc. 99(2), 184–190 (1999). 9 World Health Organization (WHO), Diet, food supply and obesity in the Pacific. (2003). 17 K.T. Khaw, S.J. Sharp, L. Finikarides, I. Afzal, M. Lentjes, R. Luben, N. G. Forouhi. Randomised trial of coconut oil, olive oil or butter on blood lipids and other cardiovascular risk factors in healthy men and women. BMJ Open 2018;8:e020167. 21 F.M. Sacks et al. Dietary Fats and Cardiovascular Disease. Circulation. 2017;135:00–00. 23 C.D. Fryar et al. Division of Health and Nutrition Examination Surveys. Prevalence of Overweight, Obesity, and Extreme Obesity Among Adults Aged 20 and Over: United States, 1960–1962 Through 2013–2014. Health E-Stats, National Center for Health Statistics. A proud Team Philippines during the closing ceremony of the 50th International Chemistry Olympiad in Prague, Czech Republic. The 50th International Chemistry Olympiad (IChO) was held last July 19 to 29, 2018 in two European countries. The opening ceremony to welcome all participants had been in Bratislava, Slovakia, while the closing ceremony was held in Prague, Czech Republic. This has only been the second year that our country has been able to participate and raise the Philippine flag at the IChO stage, and this year’s participation was made possible by the people behind the Philippine Federation of Chemistry Societies (PFCS); the Philippine Association of Chemistry Teachers (PACT) in which the Team Philippines’ country coordinator or head mentor is a part of; the Integrated Chemists of the Philippines (ICP) and; the Kapisanang Kimika ng Pilipinas (KKP). It is also due to the financial help provided by the Main and Calabarzon Campuses of the Philippine Science High School (PSHS) and the group of Team Philippines would like to thank all of these organizations and groups for the support they have provided. This year’s IChO was participated by 76 countries with 300 high school students, for a maximum of 4 students per country. The four Philippine representatives were chosen from the winners of the Regional and National Chemistry Olympiad that were held and handled by the KKP earlier this year. They are composed of three students from Philippine Science High School-Main Campus and one student from the Philippine Science High School-Central Luzon Campus. Mr. Julius Victorious A. Saluria, from PSHS-MC, acted as the coach while Dr. Jose M. Andaya, the Campus Director of the PSHS-Calabarzon Region Campus, acted as the country coordinator or head mentor. Among the 300 students, 35 received gold medals; 65 received silver medals; and 95 received bronze medals. Two of our students, Israel M. Aguba and Julius DL. Macling, received bronze medals. Our other two student contestants are Arthur Reiner V. De Belen (bronze medallist, 49th IChO) and Galen Noel G. Nifas. The top 5 students who received the Gold medals were from China, Russia, Korea, USA and Singapore, and it was the student from China who topped the Olympiad. As mentioned, this has only been the second year that the Philippines has joined the Olympiad. Considering that the high school Chemistry curriculum in the Philippines still isn’t aligned with some foreign countries, receiving two bronze medals counts as a great achievement for us. We are optimistic that this year’s competition and our experiences with it will further open up a lot of opportunities for the years to come for International Chemistry Olympiad. 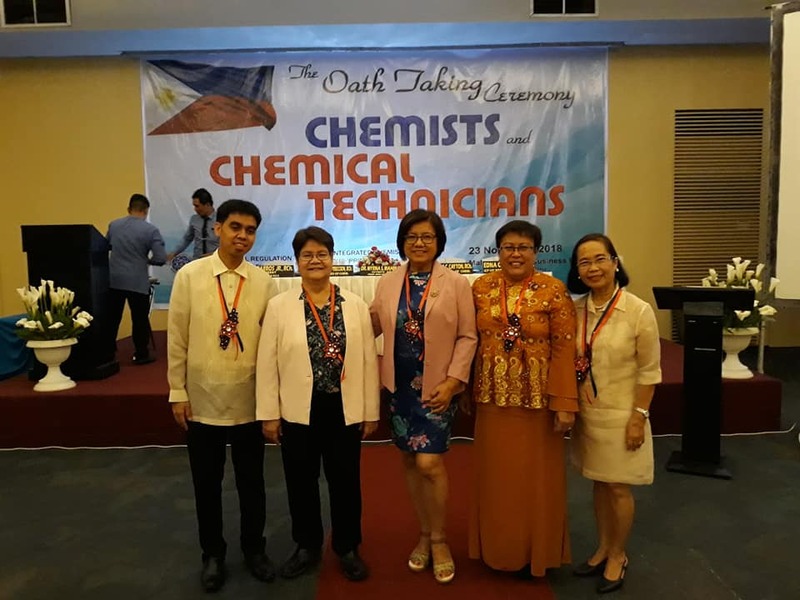 This article was written by Dr Jose Andaya, director of the Philippine Association of Chemistry Teachers, campus director of PSHS-Calabarzon Campus, and the coordinator of Team Philippines to the 50th IChO. The ICP is very proud of the performance of Team Philippines in the 50th IChO.